I know that I just recently made something from Dorie Greenspan’s new cookbook, Baking: From My Home to Yours, but as I flipped through the book I bookmarked over a dozen recipes that I wanted to try, so here is another one. 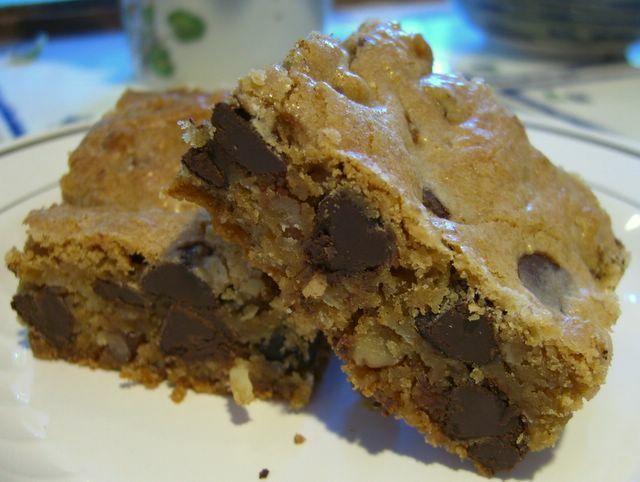 This recipe appealed to me both because I like blondies and because there is so much good stuff packed into these. A blondie is supposed to be a slightly fudgy/chewy, non-chocolate version of a brownie. In most cases, the blondies turn out to just be slightly chewy cookie bars, which is exactly how these turned out. Not that there is anything wrong with that, but if you’re looking for a more brownie-like bar, this might not be the ideal recipe. The batter is thick and doughlike – in part because of the fairly generous amount of flour and in part because there are chocolate chips, butterscotch chips, pecans (the original recipe called for walnuts) and shredded cocnut – and the only problem I had with the recipe was getting it into an even layer in the pan. I solved this little issue by lightly greasing my spatula and using it to flatten down the dough. I recommend keeping an eye on your oven temperature, or else the bars might turn out to be a touch crispy on the edges and dry in the center. Otherwise, however, they had a great flavor and a nice, chewy texture. These aren’t refined cookies to be eaten with tea, but ones to be dunked in a glass of milk when no one is watching. Preheat oven to 325F. Grease a 9×13-inch baking pan. In a large bowl (or the bowl of a stand mixer), cream together the butter and sugars until light and fluffy, about 3 minutes. Beat in the eggs one at a time, waiting until each is fully incorporated to add the next, then beat in the vanilla. With the mixer on low, gradually add in the flour mixture, stirring only until no streaks of flour remain. Stir in the chips, nuts and coconut by hand. Spread batter into prepared pan, using a lightly greased spatula to even it out. Cool blondies in the pan, but turn them out (and then reinvert them so the top is facing up) before slicing into 32 bars. I’m all about chewy cookies, so this is the recipe for me… I’m all about sugar too, so I might be extra decadent and add a drizzle of icing. Nic, my copy is so littered with sticky tabs, I’d have been better off marking the recipes I wasn’t interested in, and saving paper! Funny, itÂ´s nearly the same recipe iÂ´m using for my brownies. In germany we call them “chocolate bread”. Try walnuts and hazlenuts! I have bookmarked almost all of the blondie recipes, especially this one. It looked decadent on paper but now that i see yours I am so going to make them. Problem is, will they last long enough for a picture?! Anyway, after 55 minutes in the oven I thought they seemed done. Well they were. The edges were done perfect, if not a little soft, and the middle of the pan was still ooey gooey. I’ll be trying them again, in the 9×13 pan. Either way they taste great, thanks for sharing! Never had blondies before. I can’t wait to try Dorie’s recipe. I followed the thread about her book on egullet and now i’m desperate to receive my own copy of the book. It’s great you reminded people to check in on them in the oven: I double pan these if I’m worried too. Blondies are such great vehicles for fillings! I remember a batch of Blondies that arrived at my door, chez vous! Those look incredible! Now I can’t decide whether to try those or the blondies on the Odense web site. Odense, the almond paste people, have a blondie recipe with almond paste in it. The best ever! Close to paradise! I made these as a birthday present for a friend who hates chocolate, so I just put in 1 cup of butterscotch chips, 1 cup of toffee bits, and 1 cup of coconut. I also didn’t realize that I was out of vanilla extract until I got all my supplies home… so that got left out. Oh man. These came out AMAZING. Everyone loved ’em. AWESOME. Do you have to add the coconut in the recipe?